As long as there is an agent registered in the specified register maintained for this purpose by the UAE Ministry of Economy and Commerce, parallel importing is prohibited in the UAE. The Customs Departments, at the registered agent’s request, detain any products imported by any other person and deposit them in the port warehouses until the dispute is determined. This is of course a headache for inexperienced traders, agents and forwarders who allow cargo to be imported without first checking if the cargo has an agent registered in the UAE. A high proportion of cargo imported into the UAE perishes while waiting for disputes to be resolved concerning whether or not the cargo can be imported without the prior approval of the registered commercial agent. The UAE has undertaken several steps to implement the UN Sanctions against Iran. The main step being the issuance of a circular by the UAE Central Bank pertaining to Anti Money Laundering and the Combat of Terrorist financing. The circular outlines the requirements of the UN Security Council Resolutions including the freezing of suspicious accounts and recommending banks to conduct the necessary due diligence in relation to their correspondent banks in Iran.. The UAE Central bank has informed all financial institutions in the country, including banks, to freeze all accounts and stop bank transactions as per the instructions of the UN Security Council based on its Resolution 1929 on Iran connection. Furthermore, the Central Bank has issued a circular listing Iranian entities with which UAE banks are not allowed to deal with under any circumstance. 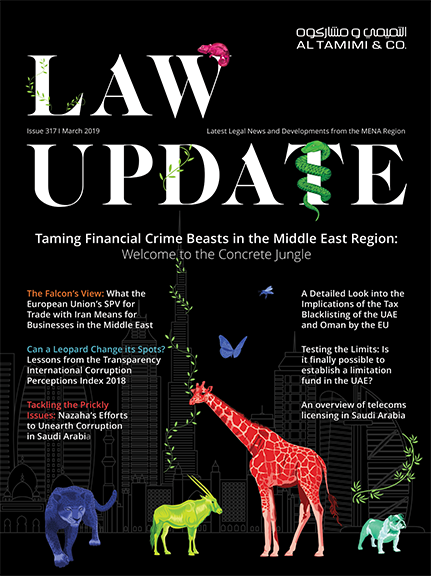 The circular states: “If you (banks) receive funds from a natural/judicial persons mentioned in the enclosures or in their favour, you are to freeze such funds ‘immediately’” Currently there is no list issued by the UAE authorities detailing the banned items however; the banned items are similar to the circulars and directive issued by the UN in this regard. It should be noted that on 20th June 2010, the Dubai Financial Services Authority warned companies based in the free zones to conduct risk assessments when dealing with banks and other clients domiciled in Iran. The Dubai Financial Services Authority said that companies should “ensure that the due diligence processes for each correspondent bank domiciled in Iran has been completed, consistent with the enhanced due diligence procedures”. It is however, no secret that the UAE, with its free trade and open market policy is a destination to Iranian traders and cargos.